Inner City Press: it’s been widely reported that Helen Clark of New Zealand is going to be named the new Administrator [of UNDP]. It was even said today, all the papers in the Pacific said this. When is the appointment expected? Spokesperson: The appointment has not been finalized yet. We expect to have it tomorrow. 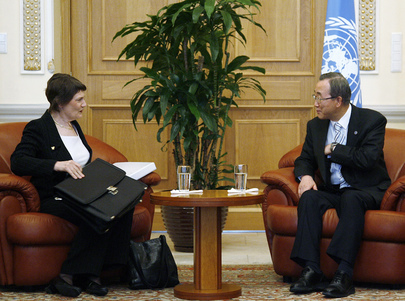 If, as it portrayed as clear, Helen Clark has won, one can only hope that Melkert, architect of UNDP's recent retaliation and non-disclosure regime, will exit the agency, where he came in second to Kemal Dervis in a more transparent selection process under Kofi Annan, then used UNDP resources to defend his previous acts at the World Bank and before that in the Netherlands. While her views on belatedly harmonizing UNDP with the UN Secretariat's Ethics Office and whistleblower protection regime are not yet known, Clark could not do worse than Melkert and Dervis in this regard. As just the most recent example, UNDP has for days refused to provide basic information about what it funds in Somalia, even as UN envoy Ahmedou Ould Abdallah through his spokesperson refers the question to UNDP, and even experts previously funded by the UN say openly that UNDP has been funding security forces in Somalia until, viewed as taking sides, it was targeted for bombing. As for Mr. Melkert, he was the one who, when asked by Inner City Press about transparency, said "you ain't seen nothing yet." Now it looks like we never will. Inner City Press: I had asked before it was confirmed that he was getting the post, Mr. Galbraith, it says in his bio that he was the United States Ambassador to Croatia in 92 to 98. He was asked by the United States Congress in 96 if he had violated the UN arms embargo and sanctions on Croatia by helping Iranian weapons get in. His answer was that he didn’t violate it because Chapter VI of the UN Charter is not binding. Is that Ban Ki-moon’s position on Chapter VI? Spokesperson: I’m not judging on what happened that time. What I’m saying is that all those concerns were certainly analysed when the decision was taken to appoint Mr. Galbraith. Inner City Press? Did they ask him… For example, has he been asked whether, now that he is a UN, you said an international civil servant…? Spokesperson: I don’t have the details of his last interview. What I am saying is that what was of importance to the UN is the role he has played for the UN before. At least for the post of UNDP administrator, the interviews were said to be coordinated by Ban Ki-moon's deputy chief of staff Kim Won-soo, who Wednesday was embroiled in a controversy triggered by Ban's seeming retraction of a written request to the G-20 members for $1 trillion for poorer countries. One wonders, and expects to find out, what issues came up in the interviews. Watch this site.